Because I hadn’t thought about receiving an award, I was very nervous when I did receive the prize. I’m too happy to believe this. 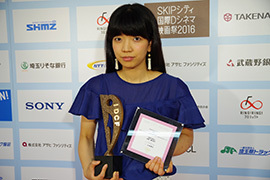 I thank the festival for not only inviting me to come here but also for giving me such a great award. 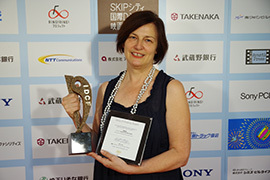 ― What’s your impression of SKIP CITY INTERNATIONAL D-Cinema FESTIVAL? I was always jealous and wanted to come to Japan whenever my friends visited Japan and told me the stories about their trips. It was my first visit to Japan, and I had very exciting experiences which were sometimes similar and sometimes totally different from those in Mexico. The Festival staff and the audience treated me very warmly. 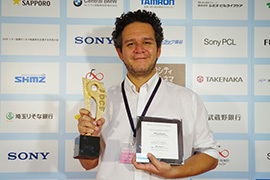 I would like to come back to Japan and especially to the Festival with another film. I’m thrilled to receive the Best Director award. Thank you very much and thanks also on behalf of Director Bentley Dean and Martin Butler. Also I want to thank to everyone related to the production, particularly people in the village on Tanna Island who appeared in the film. It’s actually not my first visit to Japan; I came here in 1984. I think Japan is a really great country although I think there are some things that have changed since then and others that haven’t. As a film producer, I feel honored whenever I communicate with the audience in the Q&A sessions. I truly enjoyed this visit because I always connect with lots of people through films and many people talked to me this time. ― How do you feel after receiving the Best Screenplay? 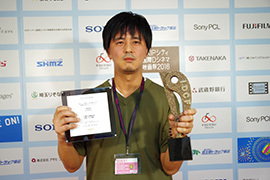 Thank you very much for inviting me to the Festival and giving the award to my film. As a cinematographer I thank all the people who were involved in the film on behalf of the director and producers. I’m honored to have the film screened in Japan. The French and Belgians grow up watching lots of Japanese films and animations, and the director who I respect the most is Takeshi Kitano. Therefore I was always tempted to come to Japan since a long time ago. I’m very happy to come to Japan this time. I think the selection of SKIP CITY INTERNATIONAL D-Cinema FESTIVAL is wonderful and I could communicate with other directors here. I hope I can come back to Japan very soon. I am very surprised because I didn’t think I’d win an award. I am very pleased because I can report the good news to the staff, cast and all the people in Osaka and Wakayama who contributed to the film. It was a pleasant experience for me because I could watch films from lots of different countries and learn about their cultures and lives through the films. I try to keep making dramas and to be a filmmaker who can express not only the light side but also the dark side of women. I would like to continue making films. I wanted it, so I’m very happy! I was feeling big love from the Festival staff and felt that the film was given first priority through the entire process. I truly enjoyed participating in the Festival because I thought the film was appreciated. I was very grateful to have so many people come to the screenings of my film, and also to have the film screened at a big theater with a big screen and beautiful image. 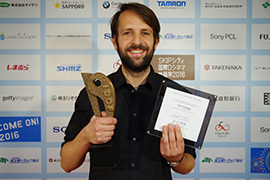 When my film Dreaming Novelist was selected for the SKIP CITY INTERNATIONAL D-Cinema FESTIVAL for the first time four years ago, I was very happy with having the film shown to the audience but also I was disappointed to not have my name called at the award ceremony. I think this Honorable Mention award is like coming back to pick up something left behind four years ago. 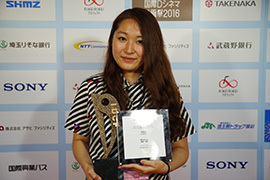 I think this is the best prize for me now because the higher award, the Best Picture, is still there and so I could feel both sorrow for missing the top award and happiness for receiving the Honorable Mention award. I visited SKIP City almost every day during the Festival although I missed out on seeing some films. I was really inspired by the films which we usually cannot watch at theaters. I found my taste and direction which I don’t usually think about through watching very different types of films. It is the best part of a film festival. 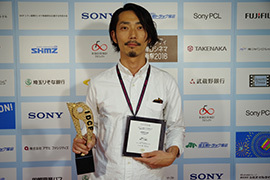 I would like to come back to the Festival with a feature film. I am not so young even though the Festival aims to discover and nurture young filmmakers. I am pleased to receive an award and inspired to continue trying hard in the future. 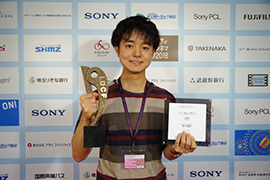 At the Festival I watched feature films mainly because I want to make a feature film next time. I was particularly impressed with Walking Distance, Out of My Hand and Crosscurrent. This is a great experience for me because I wouldn’t have come across these excellent films if I hadn’t participated in SKIP CITY INTERNATIONAL D-Cinema FESTIVAL. I want to come back to the Festival with my feature film. I’m really amazed and also pleased. I thank the Festival for their courage in awarding Best Picture to an animated film that talks about armpit hair from the beginning to the end. I was very inspired by the animation competition films because all of them are very high in quality and any of them could have won an award. 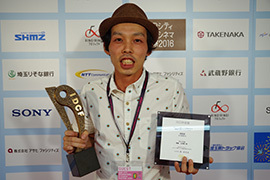 I watched feature and short competition films as well and enjoyed them because I make not only animations but also live-action films. I would like to make a live action short next time and to make a feature film someday. Returning to the Festival with a live-action film, I hope to be the first director to be nominated in all three categories; feature, short and animation competition sections. I think I gave many people a hard time because I cared so much about little details and it took a long time to complete. I got a sense of fulfillment, however, and also I would like to thank the people who supported me until completion of the film. I once shot a film at Kawaguchi Sogo High School. Then I often visited Kawaguchi and sometimes came to SKIP City. It is the first time for me to participate in SKIP CITY INTERNATIONAL D-Cinema FESTIVAL, but I felt the Festival is very well organized and attracted a wide audience. It is really hard to keep making animations, but I feel I have to keep on going. 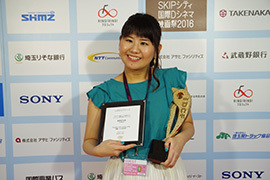 It motivated me to participate in the Festival and to receive the Honorable Mention award. ―　How do you feel after receiving the Honorable Mention? The trophy was really heavy! I sometimes participated in student film festivals, but this is the first time for me to participate in an international film festival. I was truly grateful to have my film screened at the venue with such great quality of image and sound and to receive an award. I was very nervous at the Q&A session because professional animation filmmakers were also in attendance. I was surprised but really pleased when the kids understood my film and said that they enjoyed my film. I would like to make more films to move the audience.